Mayara Pineiro photographed by Nathan Sayers for Pointe. This is Pointe's April/May 2016 Cover Story. You can subscribe to the magazine here, or click here to purchase this issue. After Pennsylvania Ballet's Mayara Pineiro and Arian Molina Soca run their Nutcracker pas de deux in rehearsal, ballet master Charles Askegard asks for just one correction. Pineiro—who is thrilling as she plunges headlong into penché, whips into crisp turns and hurls herself backward into Soca's arms—is asked to emphasize taffy-like stretches into lengthened holds. Askegard is right. Counterbalancing the lightning-quick and the sensual brings even more dimension to this riveting dancer. In just her second season with Pennsylvania Ballet, where she started in the corps, the Cuban-born Pineiro has danced leading roles in Balanchine's Allegro Brillante and Matthew Neenan's Shift to Minor. 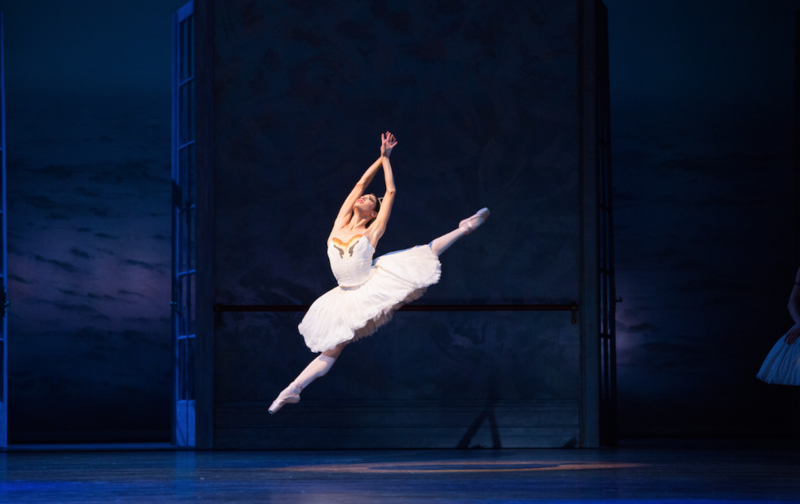 Elevated to soloist in March 2015 following her performance as Odette/Odile in Swan Lake, she continues to be given choice principal roles. “It was like fire onstage," says Pennsylvania Ballet artistic director Angel Corella of her performance in Allegro Brillante. “She's one of those dancers that comes only every once in a while." The path leading to this moment was long and challenging, including Pineiro's rigorous training in Havana, her brave defection to the U.S. and a period of uncertainty about whether she could continue dancing at all. Now, she has landed right where she wants to be. Pineiro in "Don Quixote." Photo by Alexander Iziliaev, Courtesy Pennsylvania Ballet. Born in Havana, Pineiro started ballet at age 3, and she fell utterly in love with dancing. Living in poverty, paying for lessons was a stretch. Pineiro felt she needed to repay her mother for the sacrifices made on her behalf by being the best she could. She eventually progressed to the highly selective and rigorous Cuban National Ballet School. There, she says, the Cuban methodology involves working first on technical issues like turning and balance, practicing slowly to build strength and control. Later the focus shifts to presence and performance quality. “In Cuba my teachers said, 'On the stage you reveal who you are,' " says Pineiro. Once she had begun to medal in competitions, she was mentored by the school's finest teachers, including Martha Iris and Fernando Alonso. Above all they cultivated her expressiveness and confidence onstage. Pineiro toured with the school to Italy, Peru and South Africa, winning and placing in competitions along the way. Still, by her final year she was aware of challenges she would face in a Cuban career. Dancers at the National Ballet of Cuba make only about $30 to $50 a month. She was also eager to sample a wider repertoire. Because of Cubans' allegiance to the classics, contemporary ballet is nearly nonexistent there. When she traveled with a delegation to Toronto, they made an outing to Niagara Falls and stopped for lunch. From the restaurant, Pineiro noticed a bridge leading to the U.S., and took her chance. She decided to slip away from the group, walk across the bridge to the U.S. side, and ask for asylum. She ducked first into the restaurant's bathroom to shoot a video farewell on her phone for her mother. She explained why she had to defect, and urged her mother to take good care of herself until they could meet again. Despite the anguish of leaving her family, “in my mind I thought it would be perfect," says Pineiro. “I didn't imagine anything bad." Then only 17, she was the youngest ballet dancer ever to defect. Because she was a minor, U.S. officials detained her for several weeks, needing permission from her parents before she could be released to her uncle in Florida. The documentary film Secundaria, which follows Pineiro and several of her classmates at the National Ballet School, captures the moment at the airport when her mother hears of her defection. Heartbroken, she also knows it is for the best and agrees to let her stay. Pineiro in William Forsythe's "The Second Detail." Photo by Alexander Iziliaev, Courtesy Pennsylvania Ballet. Once settled in Orlando, Pineiro learned that her relatives did not have money to pay for ballet classes. For six months, she says, “I felt I was never going to go back to dance. It was a very confusing feeling, because I had just arrived in the country and wasn't aware of how things worked. Ballet seemed so far away." In her last attempt to go back to dance, she visited Orlando Ballet. There, she met the company wardrobe mistress, whose son, Etienne Diaz, was also a dancer. “She told me to contact him, maybe he could help me find a studio." Diaz, who soon became Pineiro's longtime boyfriend, connected her with Vasile Petrutiu, who offered her free classes at Central Florida Ballet. She also received free training from Cuban teacher Magaly Suarez at The Art of Classical Ballet, in Pompano Beach. “She takes corrections right away, and she never goes back to that problem," says Suarez. “It was a great pleasure to work with her." Petrutiu's connections helped the pair land soloist contracts with the National Opera of Bucharest. In 2011, Pineiro returned to Florida to compete in Youth America Grand Prix's Tampa semi-finals. Coached by Suarez, she triumphed, winning first place. Afterwards, she guested with Balletto del Sud in Italy. “I learned so much," she says. “The time I spent in Europe introduced me to new choreographers and styles I had never seen before." In 2012, Pineiro and Diaz returned to the U.S. to be closer to family, dancing with the Milwaukee Ballet for two seasons. During their 2014 summer break, they traveled to Hartford, Connecticut, where Corella was guest-teaching. “I went to Hartford because I knew he would be there," Pineiro says. “I just wanted to take class with him." Pineiro as Odette/Odile in Christopher Wheeldon's "Swan Lake." Photo by Alexander Iziliaev, Courtesy Pennsylvania Ballet. “With her beautiful physique, she stood out right away," says Corella. “When she put on her pointe shoes and started to turn and jump, I thought I've never seen anyone turn like that. The speed is unbelievable." Deeply impressed, Corella offered both Pineiro and Diaz contracts. For Pineiro's part, she says that the former American Ballet Theatre star is a major reason why she wanted to dance with PAB. “I was very excited when he invited me. I couldn't say no." Now dancing a varied repertoire, Pineiro notes that while the Cuban approach forms great dancers, it doesn't emphasize as much the quickness found in Balanchine, Ratmansky or Neenan. Picking up the pace has been a welcome stretch for her: “Everything that I dance here is kind of fast. Now I like the speed." She has also found the perfect dance partner. Arian Molina Soca, a former National Ballet of Cuba principal who trained with Pineiro at the National Ballet School, joined PAB this season. Soca says their shared background means he can forecast what she'll do and where he has to give more force in pirouettes or in a balance. “I feel very secure, that she's in control," he says. “Together, we feel very connected." On the big stage of Philadelphia's Academy of Music, Pineiro combines a light touch with a compelling grandness and sense of occasion. Her technical brilliance dazzles—seven or eight pirouettes are not unusual for her. And now, with the thaw in U.S.–Cuba relations, she may get to perform in her home country before long. “I'd love to do as many roles as I can, to get experience," she says. “I'm loving Balanchine now, and contemporary. I picture myself here in Pennsylvania as a principal, so I'm working on that." For his part, Corella says that Pineiro's attitude—accommodating and teachable—is a significant strength. “She's evolving every day into something more and more special," he says. “In less than a year we promoted her to soloist. The other thing will happen very soon."